There are a lot of gun cleaning kits available today. Knowing which one to buy is the key to not wasting time or money. I have tried over 20 gun cleaning kits in the past 30 years. Some are good and some are not so good. Some are complicated and some are simple. I prefer simple as long as its effective. So what’s the Best Gun Cleaning Kit? It depends what type you prefer and what kind of gun you’re cleaning. A good gun cleaning kit for a shotgun might now work too well for a rifle or handgun. And conversely, a 22 cal gun cleaning kit might not be effective for a shotgun or large bore rifle. There are 3 types or technologies of gun cleaning kits. All 3 of these styles of gun cleaning kits can be effective, if you buy the right ones. Here are some brands that are the best, in my opinion. 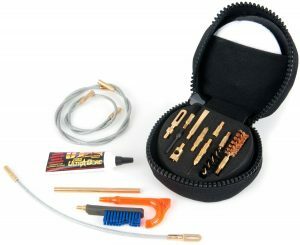 The most popular gun cleaning kits include the metal rod with screw in tips. These have been around for 100 years and have come along way. The latest cleaning rods are carbon fiber and are most likely the absolute best gun cleaning rod you can buy. They are lightweight, safe for bores, stiff, yet somewhat flexible and inexpensive. There are other cleaning rods available like stainless steel, bronze, aluminum and coated rods but it’s not worth risking your gun bore by using a risky cleaning rod. Carbon Fiber is just the best. I really like “pull through” gun cleaning kits. They make cleaning guns much easier and faster. There are 2 types of pull through gun cleaning kits. 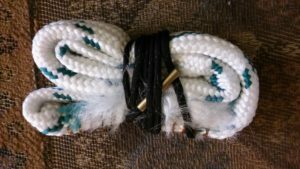 The Hoppes boresnake cleaning kit features the famous Boresnake which is a thick cotton rope with bore brushes embedded. This is of course an over-simplification of a Boresnake. It’s actually quite brilliant in design and function. I have used them for many years and find them effective and speedy. 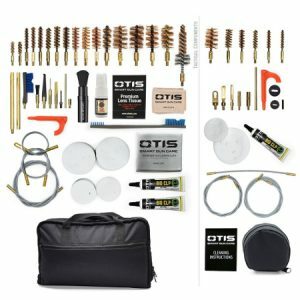 The Otis Elite Gun Cleaning Kit is a very sophisticated system that features a coated metal “Flex Rod” (or cable) that is used to pull a bore brush or gun cleaning patch through the bore. This kit is very compact and easy to bring into action. The quality is unsurpassed by any gun cleaning kit made today. Otis is tops. The Flex Rod is a steel braided cable with a nylon coating. It won’t damage gun bores and makes it easier to pull patches through a barrel rather than pushing with a gun cleaning rod. The Flex Rod is compact and will last a lifetime. There are many budget or cheap gun cleaning kits on the market that feature aluminum cleaning rods and cheap gun cleaners and oils. They cost about $10. I don’t recommend them because of the quality and would rather buy a Boresnake for $15 and some M-Pro7 gun cleaner. You might spend about $25 but you will have an effective cleaning kit that’s going to save you time and grief. The cheap aluminum gun cleaning rods will cause you grief sooner or later. They bend and the screw threads will become stripped after several uses. 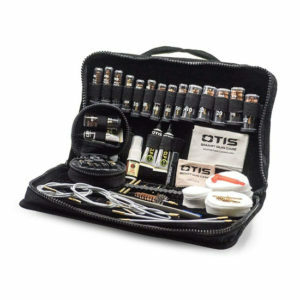 The most effective and most complete universal gun cleaning kit is the Otis Elite Gun Cleaning Kit. It will handle complete cleaning of .22 caliber guns up to 50 cal and shotguns from .410 to 12 gauge. The Elite gun cleaning kit is the only gun cleaning kit you will ever need. The Hoppe’s Universal Gun Cleaning kit is a pretty good one for the price ($30). It features a bronze gun cleaning rod which is much better than an aluminum or steel rod. Bronze will not scratch a steel gun bore. It also includes phosphor bronze bore brushes, patches, Hoppe’s No. 9 solvent and oil, slotted rod tips, cleaning cloth and rifle/pistol adapter. It comes in a nice wooden case. It can clean .22 – .38 caliber rifles and pistols and 20 and 12 gauge shotguns. This kit is also labeled the Hoppes Deluxe Gun Cleaning Kit. 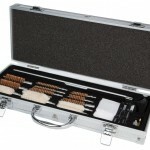 Universal gun cleaning kits are also called Multi Gun Cleaning Kits since they can clean many different guns. The Hoppe’s # 9 gun cleaning kit is a very basic and inexpensive gun cleaning kit. I think it retails for about $12. Remember…you get what you pay for. 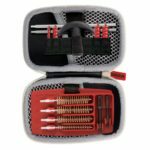 This cheap gun cleaning kit features an aluminum rod which is not ideal for rifles and handguns but is OK for shotguns. Aluminum is soft and can shave off if rubbed or scraped against a steel surface. It can also be embedded with sand or dirt and then possibly scratch your gun bore. You have to take extra precautions when using aluminum rods. Be wary of so called “Top Rated Gun Cleaning Kits”. If you are reading these review type websites, just makes sure the gun cleaning kits reviewed or rated are good quality. They should include a carbon fiber or at least a coated steel gun cleaning rod, bronze bore brushes, cotton patches, nylon utility brushes and picks, and a good solvent and lubricant or oil. Otis gun cleaning kits are perfect examples of good ones. Hoppes also makes some good kits. It’s pretty easy to pick out the good ones if you know what to look for. There are literally hundreds of .22 caliber gun cleaning kits available and most have a aluminum rod. It’s best to look for a kit that has a coated steel or bronze rod or the Otis Flex Rod. I do not recommend buying the cheapest .22 cal gun cleaning kit. Look for good quality components. Otis makes some of the best and they are not expensive. Otis is just a safe bet when in doubt. Gun cleaning will just be faster and easier with a quality kit. 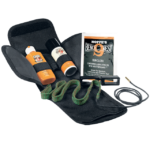 The ultimate gun cleaning kit is the Otis Elite Gun Cleaning Kit. The Otis kit is the “high-tech” gun cleaning kit featuring advanced gun cleaning technologies like the Flex Rod. The Flex Rod is a braided steel cable coated with a protective nylon sheath. You pull bore brushes and cleaning patches through the bore instead of pushing them. It’s much easier with less risk of damaging the barrel. it just makes sense too. There are hundreds of items in this huge complete gun cleaning kit. You can clean any gun from .22 to .45. There are multiple Fled Rods, bore brushes, patches, gun cleaner and oil. The Otis Elite gun cleaning kit measures about 2-3″ in diameter. There is nothing more compact or smaller and certainly not more effective. 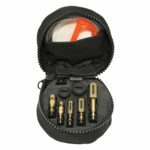 These super compact gun cleaning kits can be used as a field gun cleaning kit since you can store them in your pocket. You can take one anywhere, on a boat while duck hunting, in a tree stand, at the gun range or in you hunting vest. I never go hunting or shooting without one. The Otis Elite is a perfect small gun cleaning kit for young adults learning to hunt and shoot. It’s simple to use and organizes the brushes, patches, Flex Rods, cleaning tips, gun cleaner and oil. Everything has its own place.